For the last day of these pull apart breads, here is the classic one. My folks at home don't like the glaze on top so I didn't pour the glaze on top. So what if the the bread looks not so gorgeous? With a sprinkle of extra cinnamon sugar the world looks beautiful :). In 1/2 cup of warm milk, dissolve sugar and sprinkle yeast. Set aside in a warm place to activate the yeast. In a stand mixer bowl or a mixing bowl, sift the flours and salt, add in the oil. Add in the yeast solution to the flour and knead adding more warm water or warm milk as needed to form a soft and pliable dough. Oil a bowl and roll the dough in the oiled bowl, cover and set aside until the dough is doubled [about 1 1/2 hours]. Dust a work surface with a little flour. 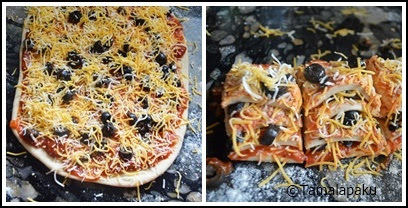 Punch down the doubled dough and stretch and roll it into a square about 11 x 11 or 12 x 12. Brush with butter all over the square dough surface. Sprinkle Cinnamon Sugar as needed all over. Make about 2 inch strips of the square dough. I used a pizza cutter to do the job. Layer each of the strips, one on top of another. Now slice the pile into 2-3 inch squares. Place the slices, cut side down in a greased (I lined with parchment paper) loaf pan (I used a 10 x 5). Cover and set aside in a warm place for a second rise. I left it for an hour. Brush the top with milk/butter. Preheat the oven to 375 °F. Bake it in the center rack for about 35 minutes or until the top is golden brown. Brush with melted butter (Optional), pull apart the slices and enjoy with more cinnamon sugar! Check out this delicious version of monkey bread. My chosen theme of pull apart breads also includes monkey breads and so if you are a taco lover, this is a must try. Meanwhile prepare the filling by gently mashing the beans, adding the spices as needed and mixing in the shredded cheese. Pinch 16-18 portions of the dough. Flatten each portion of the dough, place a teaspoon or more of the filling and close the edges so that the filling doesn't spill out. Grease a bundt pan, arrange these bean filled rolls evenly in the bundt pan, cover and leave it in a awarm place for a second rise. Top it with more shredded cheese, bake in the center rack for about 30 minutes or until the cheese on top browns slightly. Remove, let it cool for a while, run a knife along the edges to loosen the bread and serve it a sauce of your choice. I served it with salsa and salad (missing in the picture). Check out the Blogging Marathon page for the other Blogging Marathoners doing BM# 65. Welcome to another edition of Blogging Marathon. This first week I have chosen to showcase some pull apart breads which have been popular with my folks at home. So here is this bread for all the pizza lovers out there.. In a stand mixer bowl or a mixing bowl, sift the flour, salt and melted butter. Add in the yeast solution to the flour and knead adding more warm milk as needed to form a soft and pliable dough. Cover and set aside in a warm place for a second rise. I left it for an hour. Brush the top with milk. Sprinkle some more cheese on top. Brush with melted butter (Optional), pull apart the slices and enjoy with more pizza sauce!